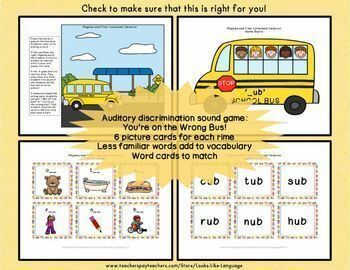 Build rhyming skills and work on final consonants P, B, M, K, G, NG, T, D and N in this picture card filled game, worksheet and activity set that your young students will love! 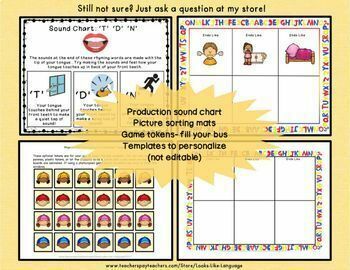 Use this activity in small speech/language therapy groups or in literacy centers to build phonemic skills. * at, et, ot, ut, ad, ed, id, an, en, un. * ap, ip, op, up, ab, ib, ub, am. Some less common words are included for vocabulary building and to give 6 different pictured words for every rime. 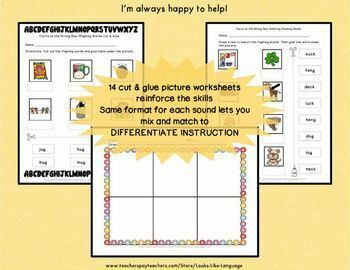 * Matching and cut/glue worksheets. 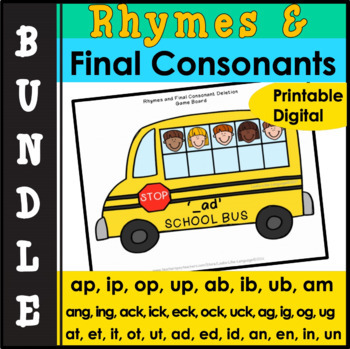 * 31 game boards for sorting rhymes/saying final consonant sounds. * 3 face token sheets to place on the vehicles. * 186 picture cards for the rhyming words. * 186 word cards for activities. * 39 worksheets to match the pictured rhymes and glue the words. * Worksheet for students to make their own rhyming page.